Recreational angling is an incredibly popular leisure activity in North America, spanning a wide demographic of our society and occurring almost every place fish can be found. Tools and techniques for recreational angling are also vast and selecting the right gear often consumes a lot of our leisure time, basements, and wallets. It is not a ‘one size fits all’ sport and, for the most part, I think we like it that way. Given recreational angling’s popularity, breadth and depth, this also means that many different kinds of fish are caught in many different ways. That is part of why we do it. In some cases anglers catch to keep, but even they have to release fish that are the wrong species, aren’t of legal size, or when the limit is reached. There is also a growing movement focused on voluntary catch-and-release—a way to enjoy the sport but potentially reduce the impact on fish. 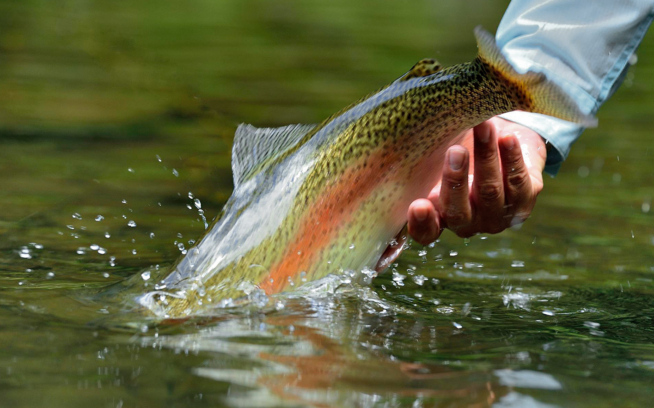 In theory, catch-and-release is more sustainable and more conservation-minded. If you see it swim away, the fish is fine… right? This is where the ‘fundamentals of fish’ come in. A couple of good friends of mine (Dr. Steven Cooke and Dr. Cory Suski, who, like myself, are anglers-turned-scientists and focus on recreational fisheries) published a research paper nearly a decade ago that highlighted that, although stresses imposed on fish are species-specific, there are some fundamentals or common ground that can form the basis of best practices for catch-and-release. Sure, there has been some ‘catch-and-release science’ performed on certain species such as bonefish, rainbow trout and largemouth bass, however, the physical and physiological tolerances as well as the environments these species reside in are quite different. 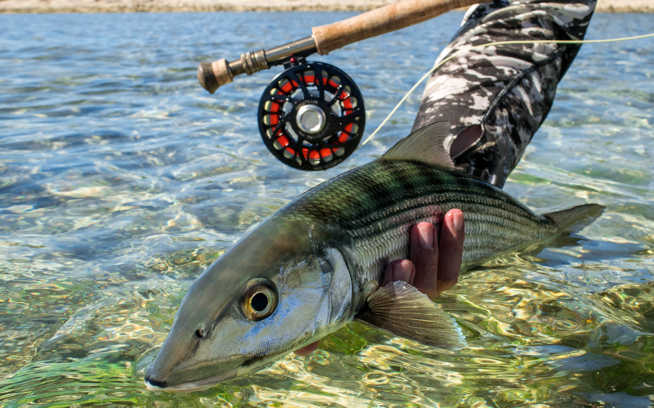 Nuances in the best practices for the catch-and-release of bonefish, such as the presence of aquatic predators (sharks, barracuda), may not apply to rainbow trout in shallow, cold, mountain streams. Nevertheless, predation could be a problem for largemouth bass, not on adults but rather on fry as they float vulnerably around the nest while the father is being caught and released. Until hard science is done on more of our favorite quarry, what are the broad fundamentals of fish that anglers need to keep in mind to act responsibly and with the fate of the fish in mind? Let’s break it down by the elements of the angling event, and focus on some things that are truly in the angler’s control. Ever wonder why a fish gives up and eventually is reeled in? Fish experience exercise-induced stress when on the end of a fishing line. We cannot and should not deny this. To fight the tension of the line, fish release sugar (glucose) into their blood to fuel muscle activity and fight when hooked up. All vertebrates in the animal world fuel exercise this way: when hunting for food, when competing for mates, when running away from a predator. Prolonged exercise and related muscle activity also results in the buildup of lactate in the blood. This has cascading effects on muscle function; the same thing happens when we run a race and get a cramp in our calf muscle or thigh. Playing fish for too long increases the response in blood glucose and lactate levels, and then it takes longer for the fish to recover physiologically following release. Across all species, match your tackle to the species and conditions, and try not to play the fish to exhaustion. The tip of a hook penetrating a fish’s mouth or other body part causes physical injury—it just does. A goal of ‘responsible angling’ is to find ways to minimize hooking damage. One simple way is to crimp the barbs; this not only reduces hooking damage since there is no longer a need to pull the barb in the opposite direction to entry, but it can reduce overall handling time. Barbless hooks can also be more easily removed by simply grabbing the hook with hemostats or pliers while the fish is still in the water. A quick turn of the wrist and the hook is free without even touching the fish. Also, if a fish is deeply hooked, several studies have shown that it is much better to cut the line and leave the hook in place rather than trying to dig the hook out. Go barbless and practice techniques where the fish is not even touched. If it is unavoidable, do all you can to reduce handling, including avoiding nets and lip-gripping devices. If you can’t get the hook out, cut the line. Fish respire (breathe) by moving water in through the mouth, over the gills and out the gill flaps, otherwise known as the operculum. Some fish actively pump the water by a coordinated set of movements involving the mouth and operculum, while others are ‘ram ventilators’ swimming with their mouths open to get the oxygenated water to pass over the gills. Either way, visualize ‘in through the mouth, over the gills and out the operculum.’ It is also important to know that water flowing the opposite way, like when moving a fish backwards, does not aid respiration. Now think of what some anglers do once the fish is landed. Taking fish out of the water stops dissolved oxygen from getting into the blood via the gills. No, the gills are not adapted to capture oxygen from air. A small number of species can use their swim bladder to ‘breathe’ but it’s generally not their preferred method. After being exercised on the end of a fishing line, it is additionally stressful to a fish to take it out of the water, which essentially stops respiration. We are forcing the fish to hold its breath after running a race. There are tricks for minimizing air exposure, like asking whoever is taking a photo to call the shots and get the angler to keep the fish in the water until the camera is ready. That being said, the goal for ‘responsible angling’ should be to eliminate air exposure altogether. Does it help to keep the fish in the water after it has been landed? Yes, and most importantly recall that the water has to move ‘in through the mouth, over the gills and out the operculum’ to maximize respiration. So, the mouth and all of the operculum need to be submerged, and anglers need to be careful not to grasp the fish so that the mouth and operculum cannot move. Holding the fish with one hand under the body and one at the base of the tail works well for many species. Fish that have experienced considerable physiological stress due to exercise and handling can lose coordinated movements of their fins and roll, nosedive and lose equilibrium. These fish should be recovered before release. If in a stream or river, hold the fish completely submerged while pointing the head into the current to promote respiration (do not move a fish back and forth—recall that water moving backwards over the gills does not help, but in fact, can actually harm the fish). Support the fish gently, do not cover the mouth and operculum, do not grip the fish too firmly and observe for coordinated fin movements. If in a lake or slack water, move the fish in a figure-eight pattern to promote respiration (again, only move the fish in a forward direction). If in a boat, put the motor in idle forward and hold the fish headfirst towards the bow. 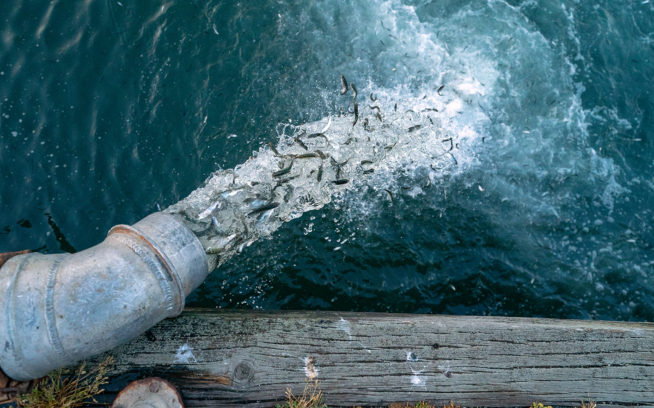 In some cases, live wells can be used to help fish recover, but be careful since these confine the fish, plus it will be important to maintain some water flow or aerate. Recovery bags have been tested for some species (Pacific salmon, bonefish) and are showing promise for allowing fish to recover before release. Overall, only move a fish in a forward direction when helping it recover, let the fish go when its fins are showing coordinated movements, it can keep itself upright and it is actively trying to swim away from you. If you are in an area where predators are circling (e.g., sharks, eagles), consider releasing the fish elsewhere, if you can. Although studies have shown that it can take hours for a fish to physiologically and physically recover from an angling event, matching the tackle to the species and conditions, not playing the fish to exhaustion, minimizing handling and eliminating air exposure will greatly reduce recovery times. This will give fish the best opportunity to get back to doing their thing, whether it will be contributing to the next generation, contributing to the ecosystem or to be caught another day. This article first appeared in issue 50 of This is Fly Magazine. Through creative writing, photography, design, art and music, This is Fly Magazine defines the lifestyle and culture for the next generation of fly fishing. Subscriptions are free. Simply enter your email address to be notified when the next issue is released. 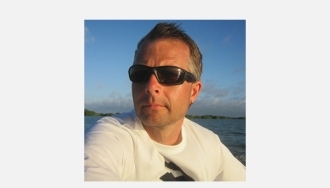 Dr. Andy Danylchuk is an Assistant Professor of Fish Conservation at University of Massachusetts Amherst, a Patagonia Fly Fishing Ambassador and a Research Fellow for Bonefish & Tarpon Trust. Much of Andy’s research focuses on evaluating the potential impacts of recreational angling on fish populations and working with stakeholder groups to develop best practices for the recreational angling community.